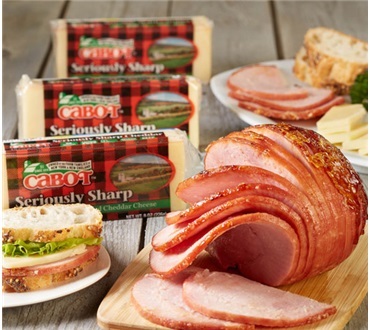 Moist and tender ham paired with sharp cheddar cheese…a great coupling to have on hand for sandwiches or for a cocktail companion atop crisp crackers. Available in two sizes and also choose from traditional ham or the convenience of spiral-sliced. Great deal and just enough! The ham was just the right size for sandwiches. We only had to feed 6 people at Christmas. The cheese is one of our favorites so we knew we couldn't go wrong. Great combo! Amazing for gifts for others or yourself. Been eating Dakin hams since I was a child and they are still as amazing.